MoneyWell was designed from day one to do envelope budgeting—it isn't just a feature we tacked on as a checklist item. At its core, MoneyWell is a budgeting system to help you eliminate debt and grow wealth. The envelope budgeting method was chosen as the core design for MoneyWell because it is proactive budgeting—you first check that you have money to spend and then you spend it. Too many other financial tools rely on end of the month budget reports to keep your spending in line, but by that time it's too late to fix anything. We call this regret-based budgeting, where you print reports and then regret not sticking to your plan. It's a broken system that most people can't use. With MoneyWell, there's one simple rule: Spend only what you have in your buckets. 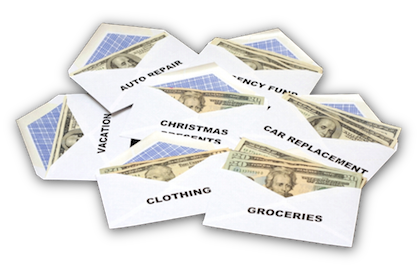 What is the Envelope Budgeting Method? Back before computers and electronic banking, money management was more basic, but having a budget was still essential. An easy way to manage cash flow was to lay out several envelopes and write a budget category on each along with an amount. Then when you got paid, you'd cash your check and divide it up according to the amount on each envelope and then set aside those envelopes until you needed to pay your bills. Lastly, when it came time to spend your money, you'd only spend as much as you put in an envelope. If you needed more money for a specific expense, you could take it from another envelope, but the rule was that you couldn't spend more than you had in those envelopes. In our world of electronic transactions, it's no longer practical to cash your payroll check and shove your money into envelopes. The majority of our financial transactions happen using credit or debit cards and often via a website. The ideal solution is to use software to simulate the trusted envelope method. That's where MoneyWell comes into play. The list of buckets in MoneyWell is equivalent to a stack of envelopes. By glancing down the list, you can quickly see what buckets are upright and have money to spend, which ones are tipped over and empty, and which are in the red and need funding. This greatly simplifies your financial decisions. If a bucket has a positive amount next to it, you can spend that money. If it's empty or negative, fill it with money from another bucket to spend money in that budget category. It's easy to reduce debt and increase savings with MoneyWell. By getting into the habit of only spending what you have in your buckets, you'll find yourself less stressed about money. The key to financial freedom is to eliminate debt and increase savings. To do this, you create a Debt Repayment bucket and a Savings bucket. Each pay period, you set aside a portion of your income for debt and another amount for savings. Continue to do this each month until your debt is paid off, then move the debt amount to savings and watch it grow.